FRANK is making waves! | Have YOU Ben Starr Struck? We’ve been doing FRANK for nearly 3 years now, which sounds like a long time, but seems like practically nothing. All sorts of exciting things have happened in those 3 years, and we’ve churned through dozens of creative, interesting, and fun menus. We were filmed for the awesome TV series The Illegal Eater which has aired around the world. And while FRANK was originally designed to be a secret…something fun you shared with only your closest foodie friends…word has apparently gotten out this month. 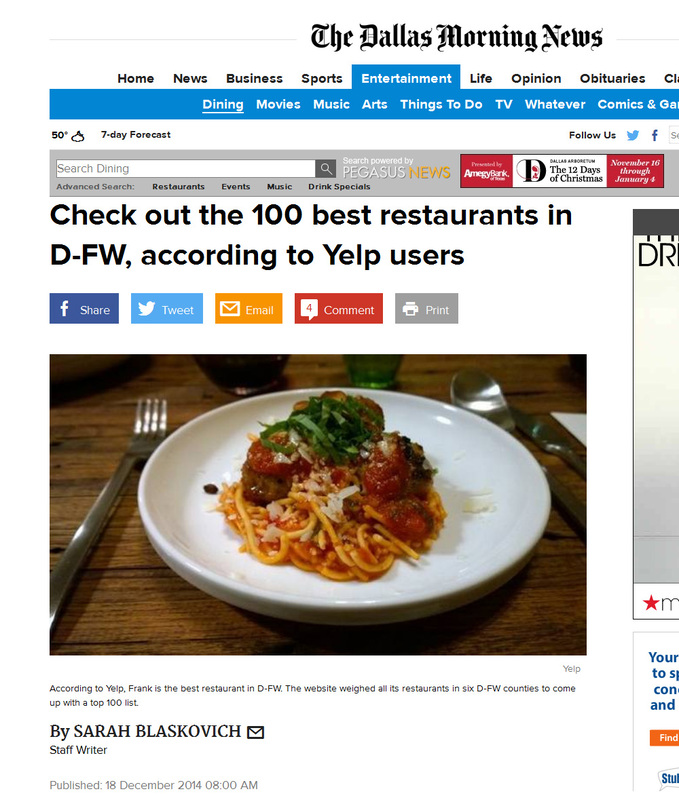 First, the Dallas Morning News ran an article entitled “The 100 Best Restaurants in DFW – According to Yelp” and listed us as the best restaurant in Dallas! This was a really interesting list, because Yelp is a user-driven review site. When you read a food critic’s top list, the list is certainly skewed to their specific taste…and all-too-often they have a palate that is jaded from years of eating at the most expensive and envelope-pushing restaurants. Certainly they don’t eat like you and I do. Yelp is a forum where everyday folks submit their impressions of restaurants, so you get a much more realistic idea of how good a restaurant is. We’re increasingly discovering that the majority of our diners have discovered FRANK on Yelp, and feel very humbled that we’re the ONLY “fine-dining” restaurant in Texas with a perfect 5-star rating there. 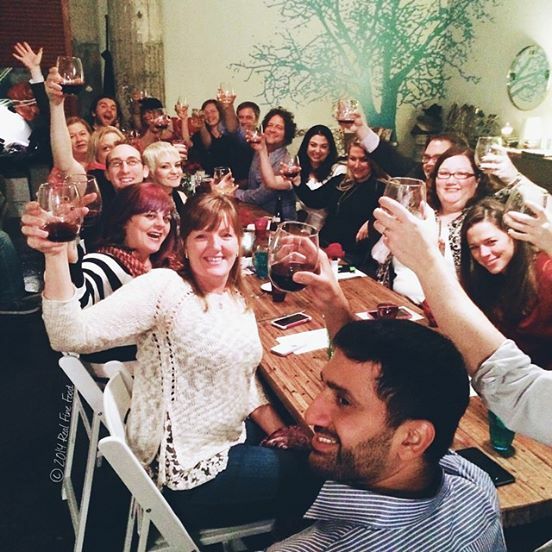 Check out our Yelp reviews to see how our diners describe the experience at FRANK! I was also excited to see several of my favorite spots on that list, including Jimmy’s Food Store (#10 on the list, absolute BEST Italian sandwiches in the area), LA Burger (#22, a Korean burger joint with delicious kimchi fries), Babe’s Chicken Dinner House (#40, a north Texas classic that I always take out-of-towners to), Hopdoddy Burger Bar (#45, breathtakingly delicious gourmet burgers, their Terlingua burger with housemade chili and fritos made me weep), Nazca Kitchen (#53, pan-Latin-American deliciousness…best yuca fries I’ve ever had by a HUGE margin), Pizza di Mia Madre (#55, a Lewisville institution that delivers fabulous pizza along with fresh-baked cookies), and at spot #93, which ain’t too shabby considering the metroplex has over 6,000 restaurants and Dallas alone has the highest restaurant-per-capita ratio in the US, is my go-to restaurant in my little hometown of Lewisville: Parma Pizza and Pasta…an unassuming family-run dive in a strip mall that lures people from downtown Dallas for its dynamite pizza, flawlessly-seared scallops picatta, and the best calzone I’ve eaten anywhere on the planet. I can’t tell you how excited I was to see it on that list! Right on the heels of the Modern Luxury article, D Magazine published a cool feature article called “Hidden Dallas” where they outlined all sorts of secret things most people don’t know about the city, and we were one of the few restaurants featured. 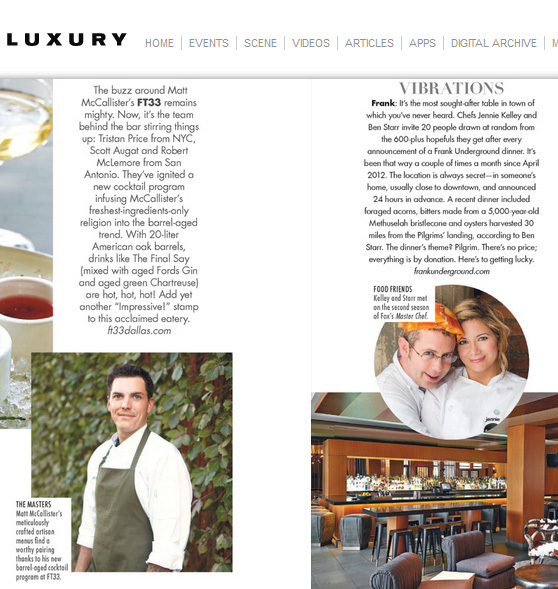 And in early March, the spring issue of Edible Magazine will featured a big spread on our Passion-themed dinner. We’re not sure what to think about it all. FRANK is just me and Jennie, and more recently Adrien, three washed-up MasterChef contestants throwing a fun dinner party and inviting a bunch of strangers. But it’s most definitely a dramatic departure from your normal restaurant experience. Often, you’re greeted by a dog when you walk through the door. You sit (VERY) snugly around a giant homemade table next to someone you’ve never met, and you eat what we’ve cooked for you in that tiny kitchen over there…there’s no ordering off a menu, and we really hope you like it because that’s all there is! But by the end of the night (usually about 3 hours after you entered), something magical has occurred. The wine has flowed and the food kept coming, and you’re talking to that stranger next to you as if he was an old friend. You’ve discovered you work in the same industry, your wives used the same florist for their wedding (who happens to be the same florist who does our flowers at FRANK), and your kids go the same college. And you’ve made plans for a double date the following weekend. And now, when you enter the FRANK lottery, you enter for 4, just like they do, hoping to increase your chances of scoring reservations again, and getting to dine with your new friends. I can’t count the number of times this has happened. Jennie and I will be attending a local food event and come across groups of folks who met at our table and are now fast friends. Because food has this amazing power to bring people together, and most restaurants don’t facilitate this power. They simply let you enjoy a great dinner with people you already know and love, despite the fact that there are probably a dozen other people in that restaurant at that moment who might change your life if you met them. Does FRANK serve the best food in Dallas? Of course not. Do we have the vision and skill of praise-worthy Dallas chefs like Matt McCallister or John Tesar? Of course not. And while it’s truly an honor to appear on lists like this, FRANK is still a humble little sociological experiment…a dinner party of honest, homemade food, sourced as carefully as we’re able, prepared with genuine love and passion, and served by us directly to those we cooked for. It’s not something we could ever do at an actual restaurant, which is why we just laugh when people beg us to open one and even offer up financial backing. FRANK is its own unique, bizarre, delightful little thing. And our guests are as responsible for making it amazing as we are. This entry was posted in Blog, FRANK and tagged best restaurant in Dallas, Dallas Morning News, Frank, FT-33, FT33, Gemma, Matt McCallister, Modern Luxury, Pecan Lodge, top 100 restaurants in Dallas, underground restaurant, Yelp. Bookmark the permalink. 6 Responses to FRANK is making waves! What a brilliant way to end the year 2014! Huzzah!